It is no surprise that the stock steering wheel equipped in the GT86/BRZ is not of the best quality because it doesn't fair very well with the test of time. For me, it was unfortunate that my wheel started to peel after I got my car re-painted because the careless painter made a nick on the steering and the wheel started peeling at an alarming rate ever since. 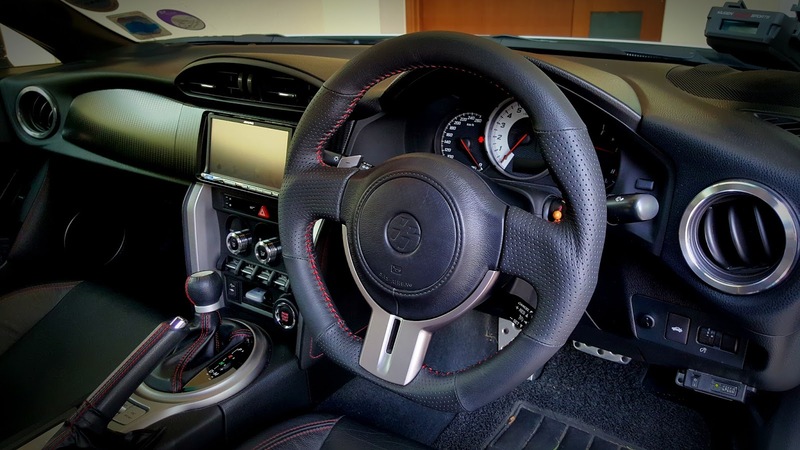 Available in leather/carbon fibre, full leather or suede, a sports steering wheel upgrade is available from Cusco just for the 86/BRZ. With my resistance to temptations at its worst, I was about to dig straight into the more expensive carbon/leather option for the 'supercar' appeal. But considering the equatorial hot weather, the carbon fibre grip would soak up much heat under the sun. In terms of practicality, the full leather seemed like the way to go because I wanted to avoid burning my hands in the open parking lot. Something to consider when the Mrs is behind the wheel as well. Ruin those hands and it will ruin your life! 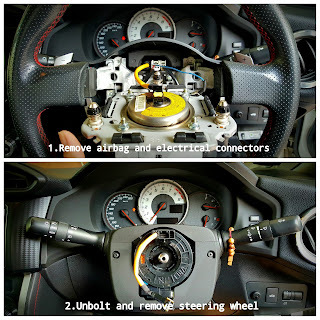 Installation was rather straightforward but if you are unfamiliar with such stuff, have sweaty palms or have a track record of breaking stuff, I suggest you have it done by the professionals at your local garage. To do it yourself, you will need a 17mm socket, wrench, screwdrivers and some force to pull the wheel out. 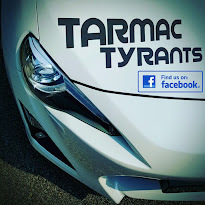 Do not forget to remove the 7.5A fuses for your horns or your neighbours will not like you very much when you horn goes off during the install. A word of caution. Take special care not to damage any of the wiring harnesses for the airbag clock spring, cruise control and pedal shifters in the process or it will result in a very costly fix! By comparison, the difference is pretty obvious. 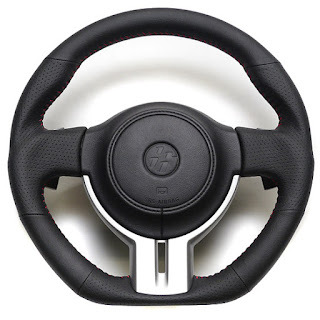 Although the Cusco steering maintains the 350mm diameter, the D-shape base does allow a little more legroom for drivers to get in and out of the car easily. So damn racecar! The genuine leather is well stitched in red and Cusco has managed to remain very competitive in pricing without compromising quality. At this stage, migrating the pedal shifters, cruise control and plastics was a walk in the park. Putting it all back together and re-installing the steering wheel into the steering shaft was all it took. Nothing to be overly concerned but the slots on the steering shaft differ slightly from one to another. Hence, the final steering alignment was not exactly dead centre. Initially, I thought I installed it wrong but with the lock-to-lock test being equal, I figured that it wasn't me. Not a big deal as this can be compensated by adjusting the tie-rods. Cruising out of my driveway, my cabin was engulfed in the smell of fresh leather and everything felt new. Okay, it was purely psychological but nevertheless it felt like a million dollars. 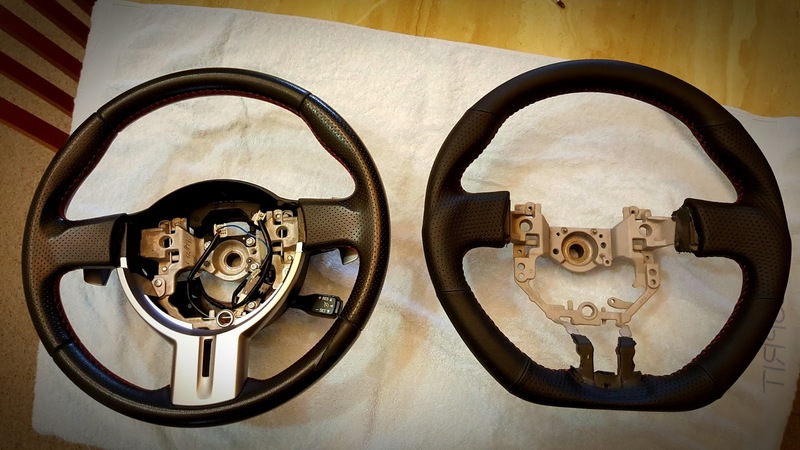 With the slight increase in overall thickness, the feel was more assuring each time I turned the wheel. What I like best about the Cusco was the gun grips at the 3 and 9 o'clock positions. While I have found other aftermarket customs to be unnatural and uncomfortable, the Cusco was really comfortable to hold as the semi soft inserts 'molded' nicely to my palm. I especially loved the D-shape base as it helped significantly when going around parking lots. So, with genuine leather now in my hands, the overall interior felt more premium and the gloom of 'cheap' interior had somewhat perished. 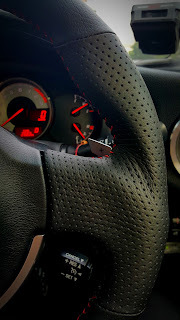 Compatible with the stock airbag, pedal shifters and cruise control, this was an upgrade that I should have done sooner when the Japanese Yen was weaker. Today, the driving experience is more engaging with the sportiness of the D-shaped wheel and gun grip sides. Okay, cheap thrill but the Cusco kind of looks like the steering wheel of an Audi R8 at a fraction of the price! What more can one ask for in a poor man's LFA?